Tim Ferris just shared some pictures of bookshelves that belong to certain “thought leaders.” As someone who loves books, has too many of them, and can only “display” a small percentage of them, I thought it was pretty interesting. So above you’ll see a small slice of the books I have on “display” between Dora books, princess stickers, and play-doh containers. I didn’t prepare for the picture or try to do anything to change it from what you would actually see if you were in my place, and I wonder if the people in Tim’s post did or didn’t. Vanity being what it is, I’m sure at least some of them did. 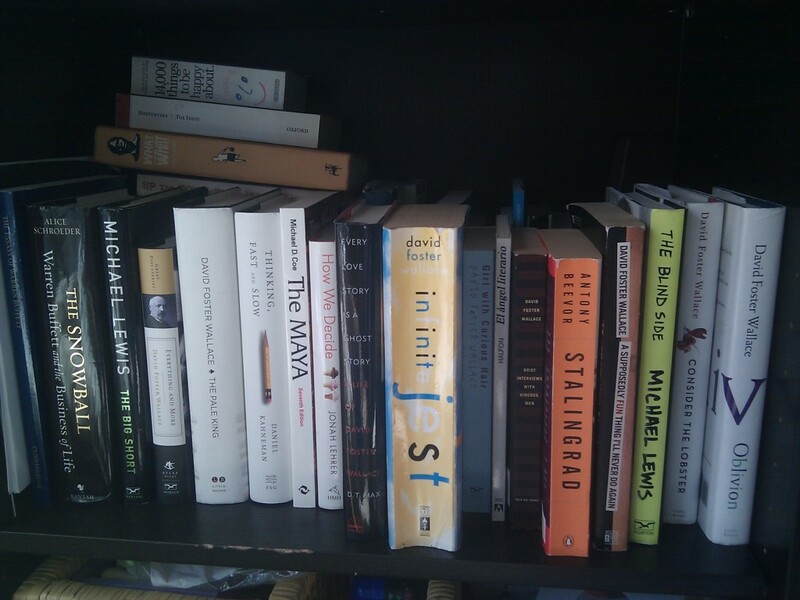 What does my bookshelf say about me? Well, I like David Foster Wallace, obviously. Other than that, I don’t know…what do you think?